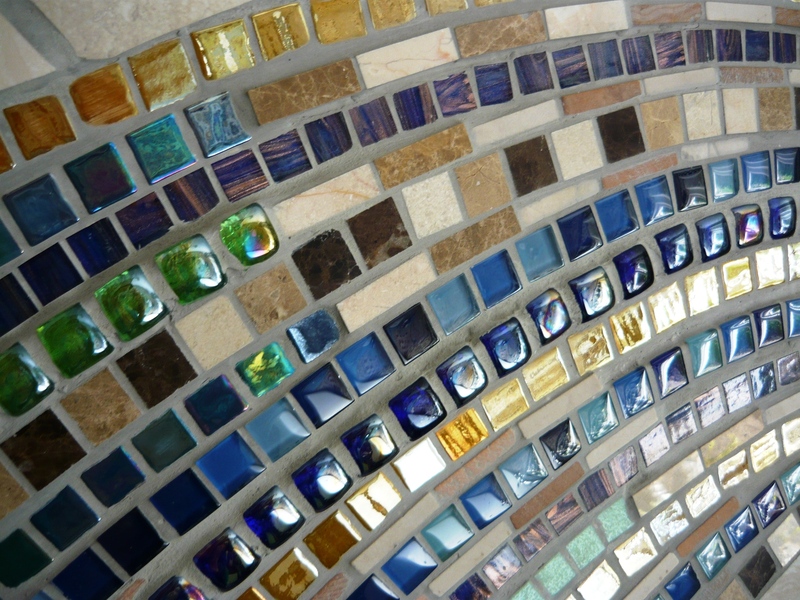 It is also important to make the floor rather neutral if you have a lot of mosaics on the walls or vice versa. A colourful designed floor can be very effective if the walls are more toned down and neutral. Think about how you want someone to feel whilst being in the space. We think the ceiling is best painted white, or in a light colour so as not to interfere with the walls and floor too much. 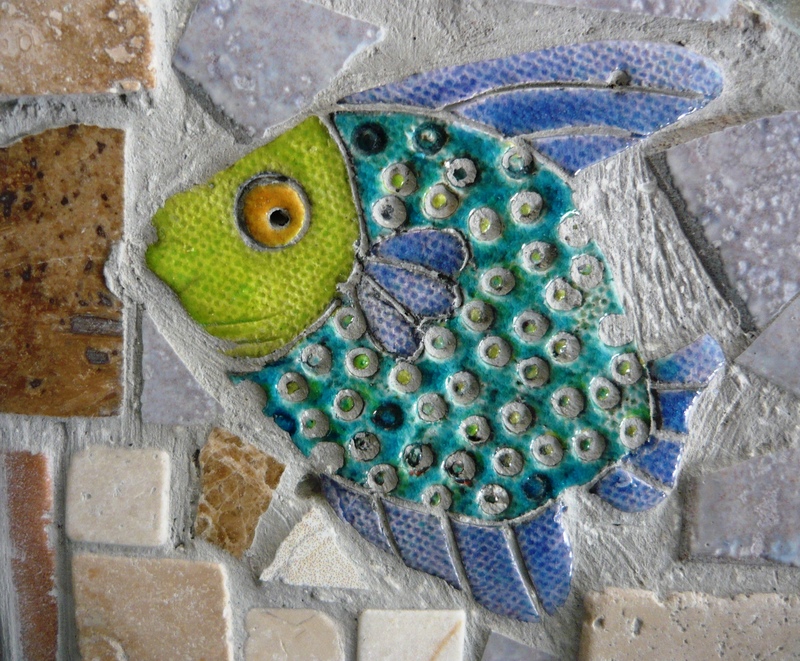 In some of our other posts in the mosaic category we have described how we make our mosaics and where we get our tiles so this time we will concentrate on the actual design process. 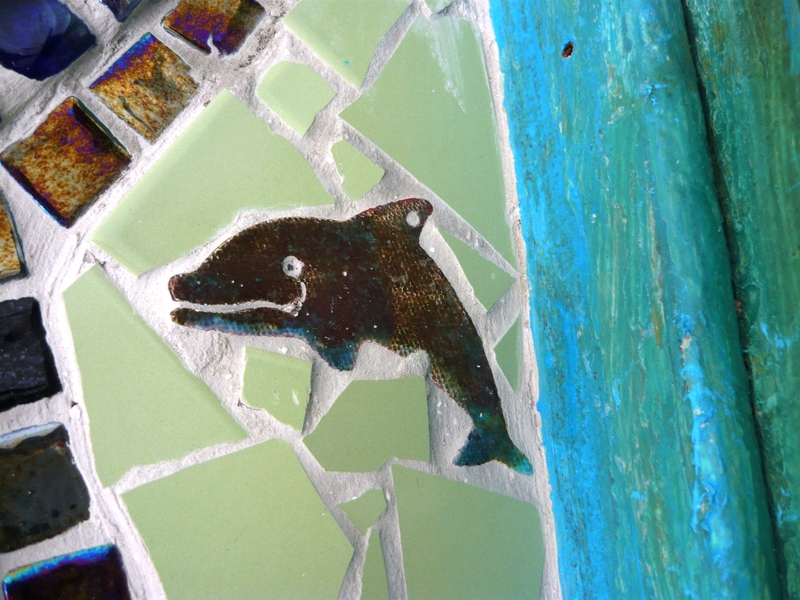 We found a large natural stone mosaic on a backing-sheet that had been discarded at the local tile shop as it had a few tiles missing from a corner. We also found a lot of natural stone tiles and built up the design around the square in a similar pattern, echoing the wavy lines further out. 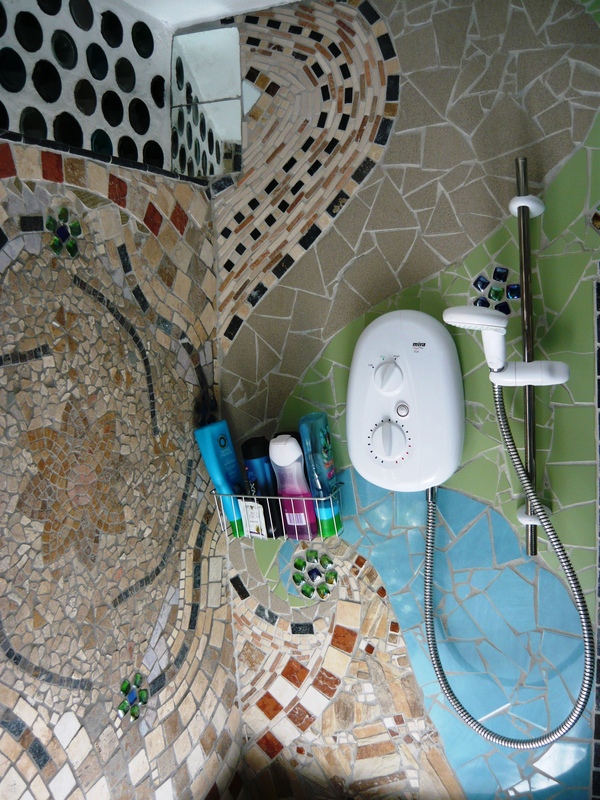 We added some flowers made out of translucent glass mosaic pieces and we added them to all the walls around the bathroom for continuity. 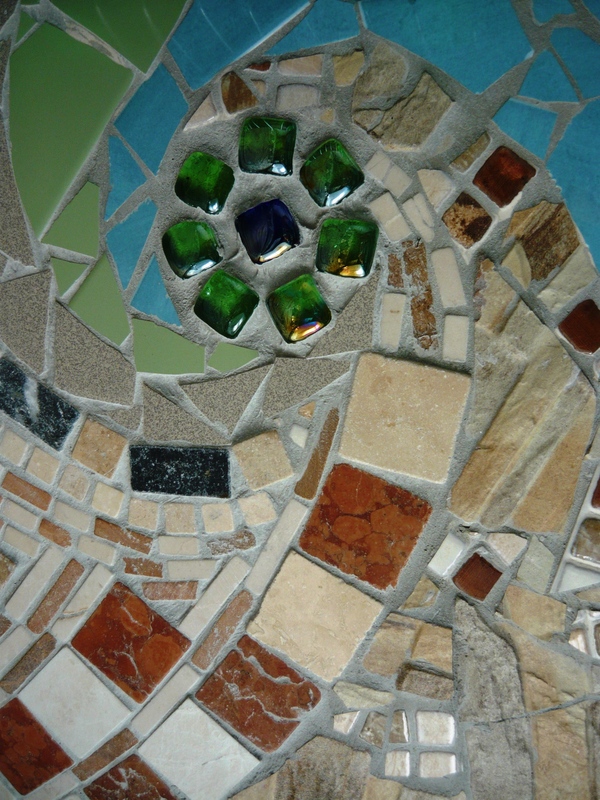 We let the pattern from the wall with the natural stone center mosaic continue across the corner to the wall with the shower as it binds the two walls together. 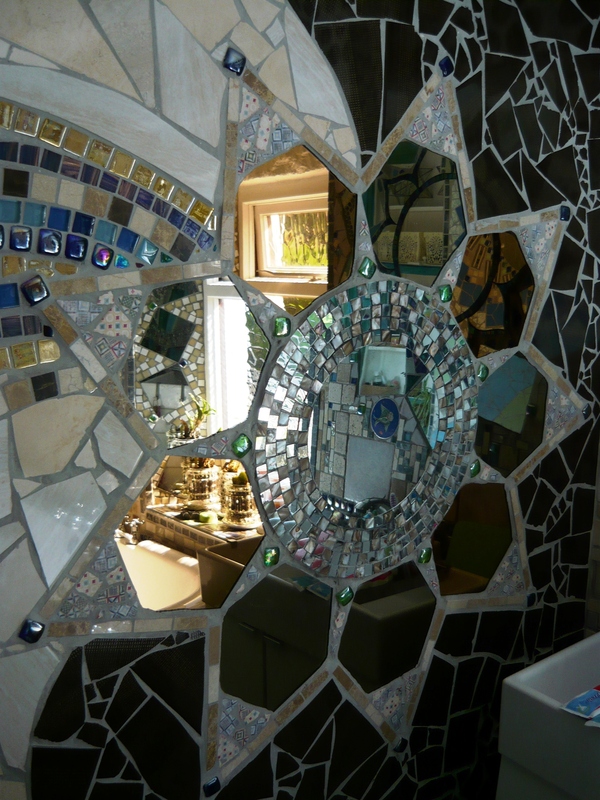 On the opposite wall we started with a big round mirror and built outwards adding tiles in a repetitive pattern around and around. 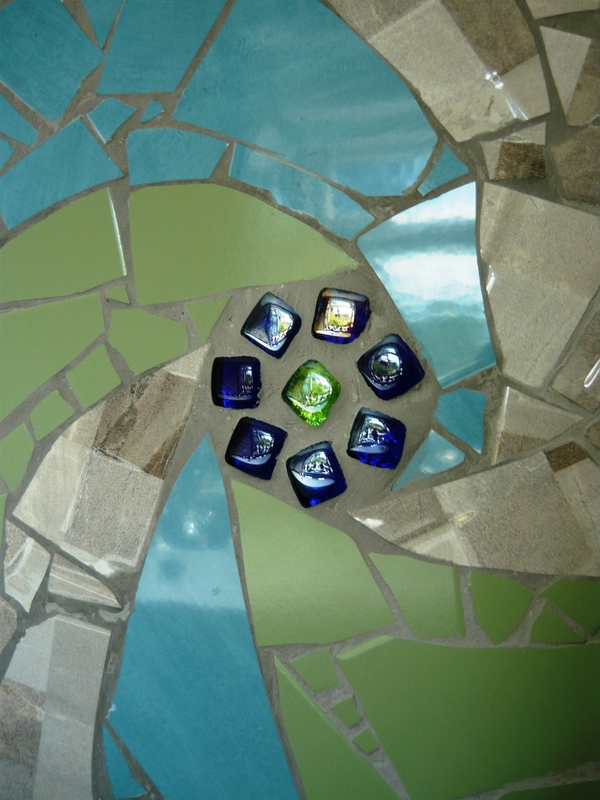 On the bottom of the wall we first tried to add three different tiles in a random pattern, but it looked untidy and erratic so we came up with the idea of using the flower design from the first wall and adding a spiraling pattern around it. It created a very calm and harmonious pattern and we went across to the wall by the shower as well and did the same thing but in the opposite direction. This wall is also home to our discovered sash window as this used to be the old outside wall of the cottage. We have made it into a useful shelf. 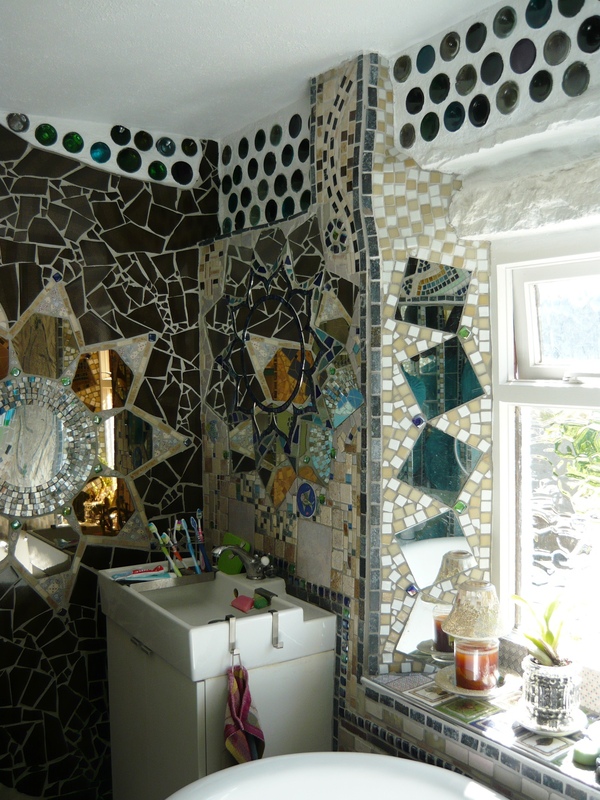 We had some more mirrors and created a large shooting star on the wall opposite the shower. 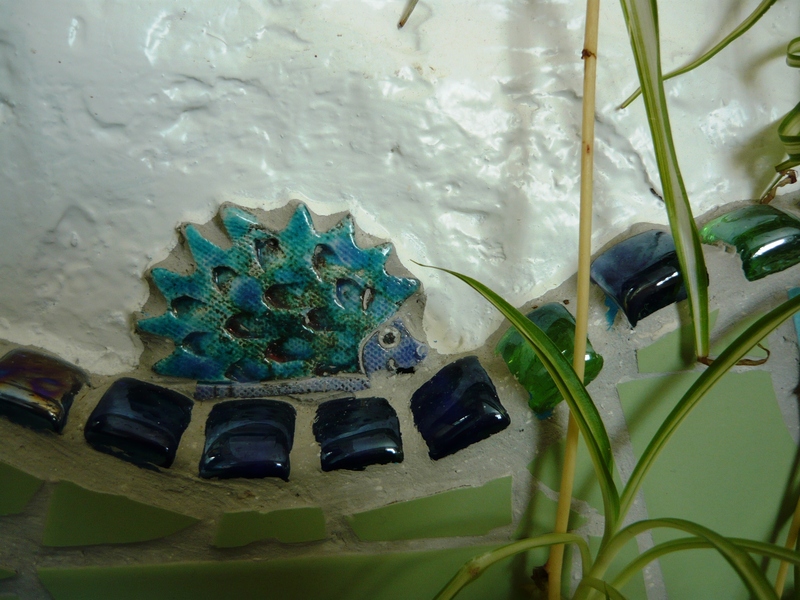 The tail is made out of lots of different small tiles, and although it was a bit tricky to grout it we are very happy with the result. It is tactile and beautiful. 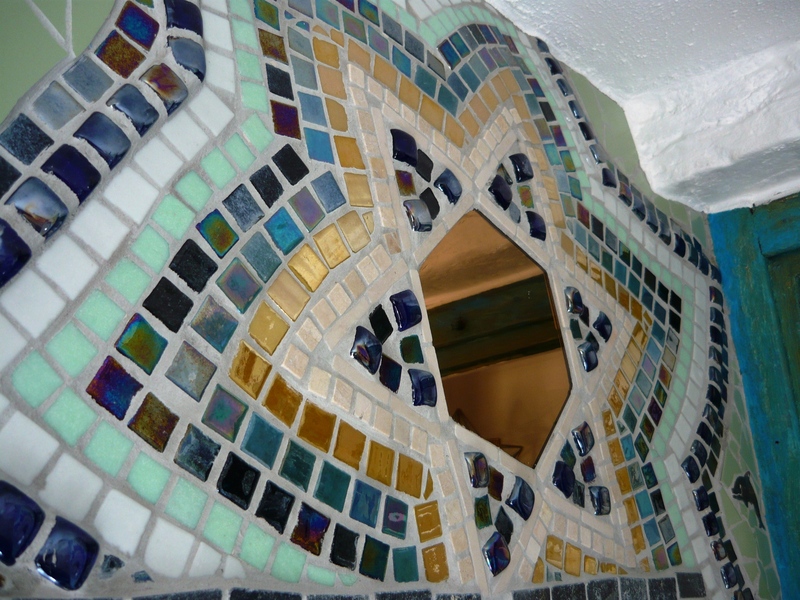 We also made another star on the wall over our toilet alcove and we are pleased with how it turned out. 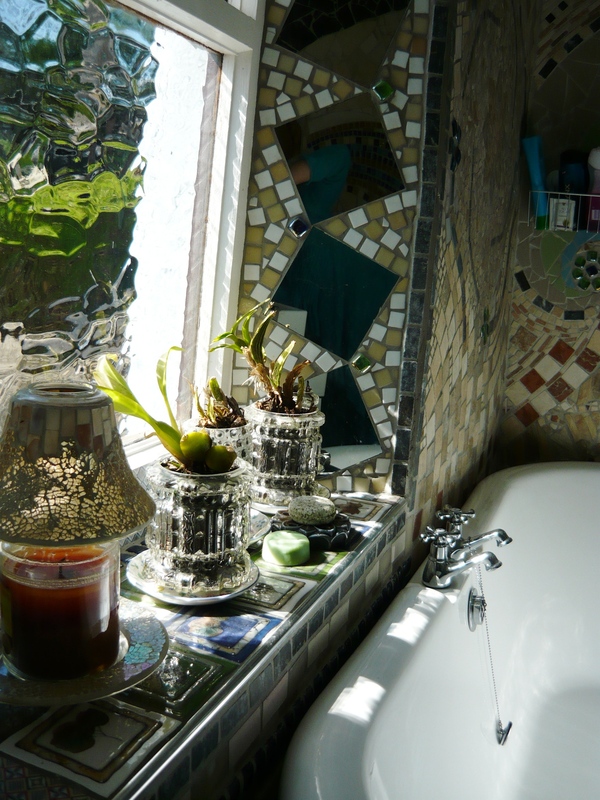 The hexagonal mirrors can be bought at IKEA for a small price and are very useful for creating star designs. 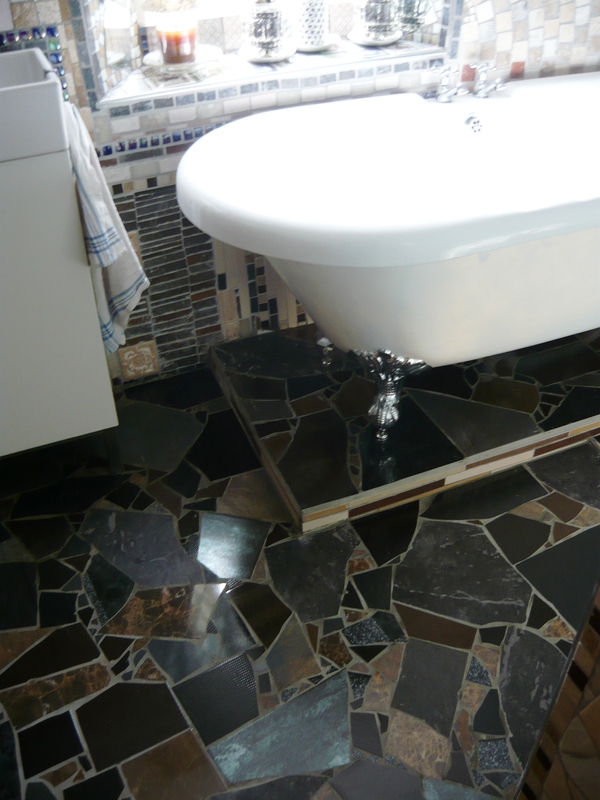 On all the edges we added black or natural stone tiles as it defines each mosaic area nicely. We have had quite a few visitors since we finished the bathroom and they have all said the same thing. 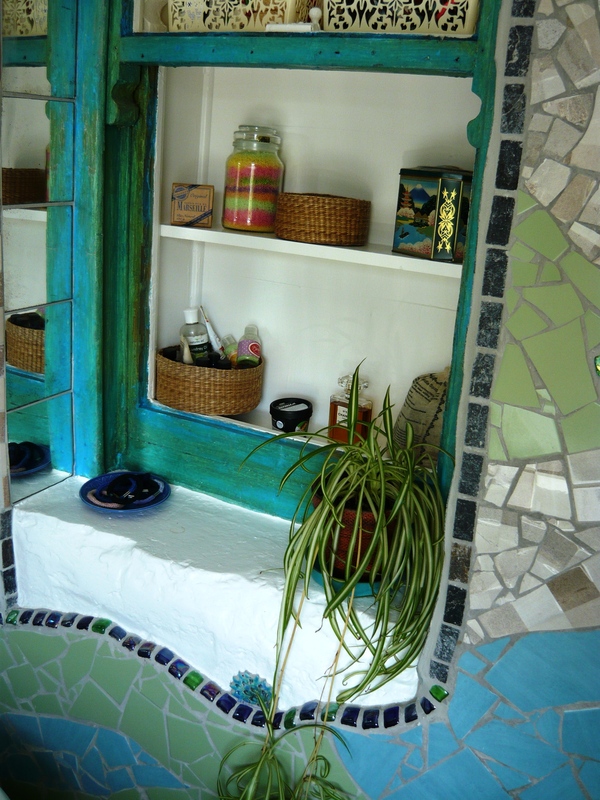 It is a calming and restful, beautiful space. 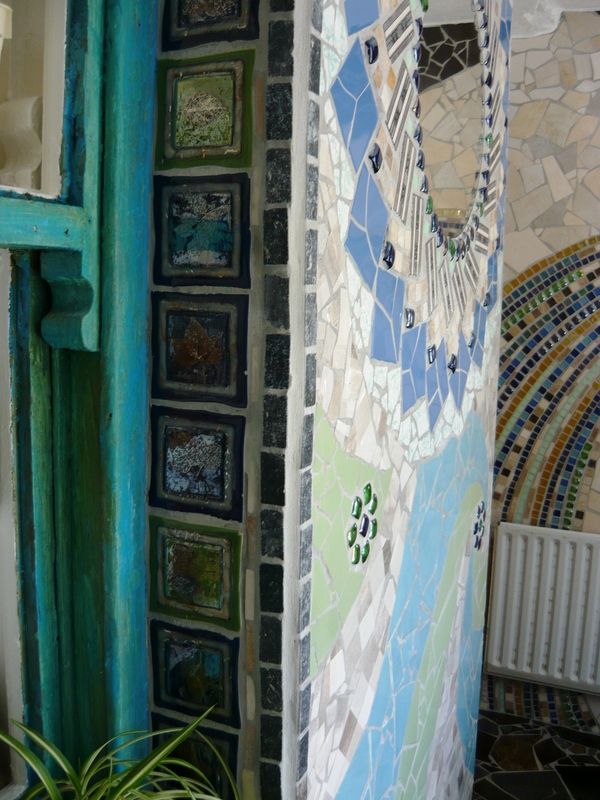 It could have been quite easy to overdo it as so many areas are covered in mosaics but we are happy with the end result. 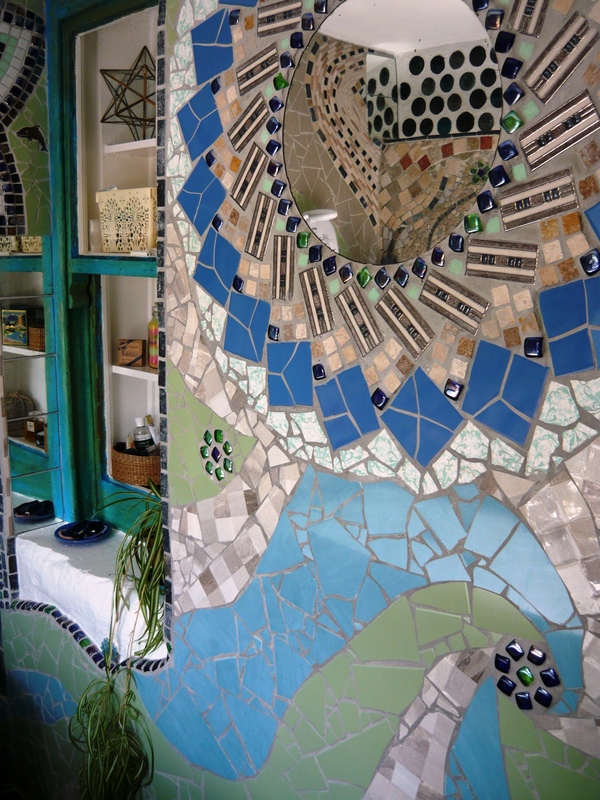 At least 80% of the tiles used were rescued from the tile-skip and a certain future in a landfill site. It gives us great pleasure to look at them now. ← Woodland management on a small scale. 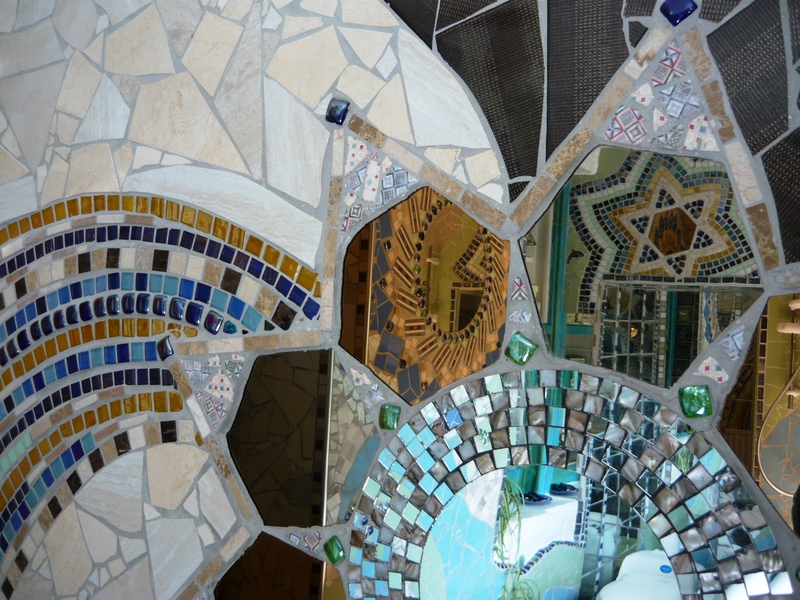 Your mosaic is beautiful. .. It must have taken weeks. . But you’ll be able to enjoy it for years..
A vacuum in the bottles would exponentially increase the thermal insulation factor of bottle walls. This could be achieved by dropping a burning spill into each or boiling and then plugging each with a simple tapered bung. That sounds great! Thanks you for sharing this information. 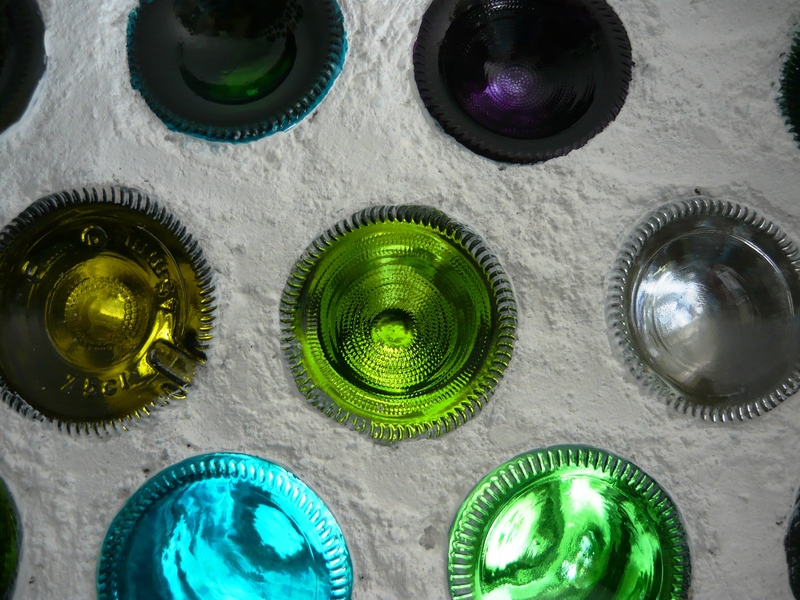 All of our walls are done with bricks made from two bottles or jars each to make for maximum light intake. I wonder if there would be a practical way of achieving a vacuum in such walls.